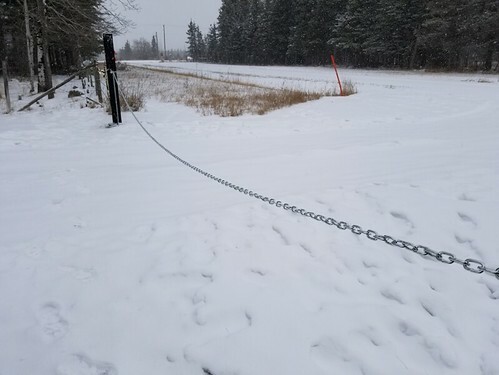 Since we no longer have a gate at our driveway, one of my priorities yesterday was to pick up some chain to put across as a temporary fix. I ended up getting more than 30 ft of chain, so there would be enough to go around the posts. Even going with a smaller chain, it cost me almost $75. Thankfully, we’d already picked up a set of 4 locks, so I didn’t have to get more of those – in locks alone, plus key cutting, we’ve probably spent close to $100. All this because of one person. This morning, I took photos of each of the hinge pins. They had all been bashed with a sledge hammer, and are now bent beyond 90 degrees. One is even bent sideways. Which means the gate cannot be put back on the hinges. Until we can get these fixed, we’re stuck using just a chain. We are hoping the property insurance will cover any costs, if it comes to that. What I haven’t mentioned before, but can do now, is that after the last time we found glue in our lock, we set up a trail cam. Another temporary measure until we can afford a surveillance system. I have it set to video, which means when the motion sensor is triggered, it takes 30 seconds of video. I’ve got it set to the minimum delay between videos, which is 15 seconds. Part of my daily rounds is to switch memory cards – and batteries, as need be. They drain amazingly fast, when it gets cold. Another expense to add to the list. What this means is that I have a series of time and date stamped videos of the person who did this, clearly visible and identifiable. He came over at 7pm (it’s full dark by 5:30pm, this time of year, but the infrared flash picked him up quite clearly) with a jack to take the gate off the hinges. Then he started banging on the hinges with the jack. After a bit he left, then came back about 20 minutes later with a sledgehammer. After banging on the hinges, he went into the property, then left 4 minutes later. Then he came back just before 5am, and moved the gate from the ground, over to the side, where I found them several hours later. Which made yesterday a busy day. Along with going into town to get a long enough chain for the gate, I had to contact the RCMP. The nearest is in the town my mother lives in, and the woman I spoke to took some notes then, after the call, she made the file, then passed it on to an officer, who would call me back. Perfect timing, he called after I got home from getting the chain and putting it up. After talking to him for a while, and after he checked and double checked that I did want to press charges – making sure I knew I would need to make a statement and might have to testify in court, if it came to that – we worked out that I would go to the station to make a statement and bring the video and image files for him to copy. Not in the town my mother lives in, though. I had to drive to a town 3/4s of the way to the city! Before I left, just in case, I found and printed out some emails going back about a year, that served to document other incidents and provided other information I thought they might find usable. Then off I went. I actually got there after office hours, but his shift ended 2 hours after that, so he was ready for me. We did an interview and, because he noticed two other reports on file, he asked me to cover some of the history. Which meant I had to very briefly explain a year’s worth of stuff, just to get to talking about the gate! At this point, it is now up to the crown prosecutor to decide if charges are warranted, and he did include the emails, as they show that there is a history. Some time today, they will talk to the person and place conditions on him. I will be kept informed. After that was done, before heading home, I called my mom to make sure she would be around, then stopped at her place on the way home. She did not know about the camera until then, but she was very happy to hear about it. I was even able to show her some of the videos. She was glad I went to the police, but also really upset that we had all this happening to us – after all, we’re living here because she asked us to take care of the place for her! I assured her, it’s still better than was we left behind at the co-op. So we are left with a lot of questions. Most of which start with “why…?” One of the things that we talked about is how, the gates can’t stop people. We’re on a farm. We have barbed wire fences. Any person can slip in, any time. But if someone wants to drive in, they need to use a driveway and a gate. 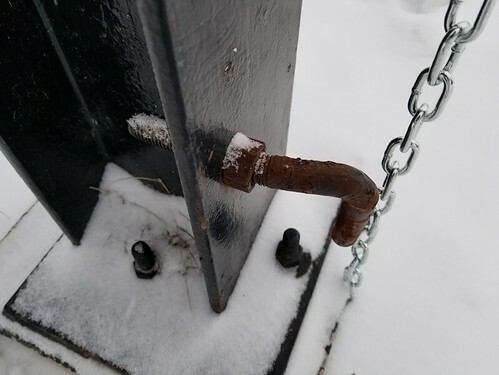 Removing the gate – and damaging the hinge pins, so it can’t be put back up – suggests he plans to drive in. And do what? What’s left to take from here? All the useful, working stuff has been taken (by him), long ago. What’s the point? I am hoping that, now that the police are involved, that will finally put an end to this. The concern, voiced by a few people now, is that it will instead trigger him into doing something even more stupid. And this is a person who drinks a lot and has a lot of guns. Yes, the police were warned, even though I don’t think it would be an issue, but just how off the deep end can someone go? It was even suggested that, once he knows about the trail cam, he might shoot it or something. The problem with that is, I recall he’s not a very good shot, and the cam is on a tree. If he misses the tree, he could potentially hit the house. I don’t think he’ll do something that stupid, but then I didn’t think he’d do something as stupid as what he did to the gate. *sigh* Ah, well. It is what it is. We’ll deal with it as it comes. Update: well, that was fast! I just got word that the police have already visited this person. I’ve been informed that he will fix the gate if I will drop the charges. Which is a joke, since this person is notorious for trying to fix things and causing more damage. It seems he tried to garner sympathy by talking about how much this will cost him, and how he can’t sleep because he’s tormented (considering the timing of this, he can’t be talking about the gate). I am not dropping charges. We’ve been tormented for a year. If we let it slide, it’ll just keep happening. I am so sorry about all this! I am so glad you had the camera up!! So am I! The constable mentioned there is a major problem with property crimes pit here, and they are telling people to get trail cams. They can be put just about anywhere. He said to keep using it!